A local repairman was recently fatally injured while working on an elevator in Manhattan. The accident is a tragic reminder of the need for all workers to receive critical safety equipment when working at a height on New York construction projects. Read on to learn more about the lethal accident, and contact an experienced Manhattan construction accident lawyer if you’ve been injured on the job. The recent accident occurred at the site of a 12-story hotel project in Kips Bay. The 33-year-old man, an employee of U-Tek Elevator, Inc., was on the 9th floor in the process of installing an elevator in the building. Eyewitnesses describe the man as losing his balance while standing near the empty elevator shaft and falling into it, down to the ground. Emergency personnel discovered the man unconscious and declared him dead at the scene of the accident. The man was not wearing a safety harness at the time of his death. In the past year, the building, located at 111 E. 24th Street, has been the subject of roughly 20 complaints, and the New York Department of Buildings has now issued a stop-work order for the construction site. Hundreds of workers each year are killed while working at a height, whether on scaffolding or a ladder, or on a platform above a trench or shaft. 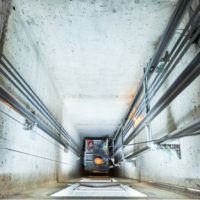 The Occupational Safety and Health Administration (OSHA) has created a detailed set of rules and requirements for employee safety, including stringent requirements regarding the safety equipment that should be provided to workers when they’re in or near elevator shafts. Whenever employees are working on a surface with an unprotected edge that is at least six feet above a lower level, they must be protected by guard rails, a safety net, or personal fall arrest system. Additionally, the New York City Building Code includes protections for work in elevators. When that life-saving safety equipment is not provided to a worker, the property owner and/or employer could become liable for the worker’s resulting injuries. New York holds employers strictly accountable for failing to protect workers from fall injuries under its Scaffold Law. With the help of an experienced construction accident attorney, workers and their families can pursue the money damages they deserve after a catastrophic fall accident on the job. If you’ve been hurt at work in New York and need help recovering the damages you deserve, contact the seasoned, effective, and professional Manhattan personal injury lawyer Leandros A. Vrionedes for a free consultation at 212-889-9362.